Classical Greek Oligarchy: A Political History. Matthew Simonton. Princeton: Princeton University Press, 2017. Between tyranny and democracy there was oligarchy in the classical world. However, the rule of the few has been neglected by scholars, even when such a study, especially with today’s growing class divide, is all the more pressing. Matthew Simonton’s Classical Greek Oligarchy remedies this deficiency in our knowledge by showing how oligarchs preserved their power. 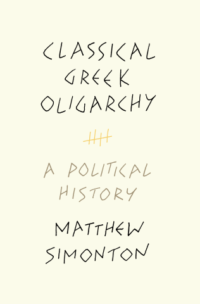 Meticulous, accessible, and insightful, Simonton presents a fresh and much-needed account of oligarchy and how it worked during antiquity. Chapter one introduces the theme of the book by defining oligarchy as a specific constitutional alternative that arose in reaction to democracy. Initially established during the Archaic period to prevent the emergence of a tyrant from their own ranks, oligarchs in the fifth and sixth centuries redefined themselves against the democratization of the poleis by emphasizing their wealth and status as full citizens. These elites perceived democracy was a potential threat to their class interests and therefore devised similar social and political institutions across poleis which can be categorized as oligarchy. Simonton addresses the question what accounts for the survival of oligarchy given the mass appeal of democracy. Adopting the new institutionalism paradigm and providing abundant historical evidence, Simonton argues that oligarchy survived when the elite were united and the masses were incapable of collective action. With the right set of institutions, oligarchs established social and political equilibria in their poleis which no one individual would have chosen if left to his or her own devices. Chapters two through five examines the social and political institutions of the oligarchs that enabled them to maintain power. Chapter two investigates the institutions that promoted equality among the elite to prevent violence erupting and becoming widespread. Unlike the interchangeableness of democratic equality, oligarchic equality is individualistic, with each oligarch viewing his personal qualities as indispensable. Institutions promoted equality not out of principle but to prevent violence in the event an oligarch were dishonored. The institutions oligarchs used to govern relations among themselves were the council’s veto power; social practices, like drinking parties, to build consensus; the secret ballot; sumptuary laws; censorial powers; and exile. These institutions allow oligarchs to enforce equality among themselves and thereby create stability within their class to govern the polis. Chapter three examines the relationship between the oligarchs and the democrats One way for oligarchs to govern democrats was repression in the form of secret assassinations, nocturnal trials, and summary executions or public spectacles of punishment (which were rarely used). Another method was cooption where oligarchs satisfied democrats’ desire for inclusion but channeled it into oligarchic stability. This would include the limited power given to assemblies (e.g., veto power only), granting certain democrats prominent positions in the regime, and the rewarding informants. Like in all the chapters, Simonton provides historical evidence of these practices to illustrate these techniques. From chapters two and three, we see that oligarchs were not only concern about the democrats revolting against their rule but also appeals to them from one of their own class. These institutions permitted the oligarchs to rule in spite of the wave of democratization that swept through the poleis in the fifth and sixth centuries. Chapter four looks at how oligarchs adopted precautionary measures to monitor and control public spaces, like the agora, because these venues could potentially be places for democratic collective action. Oligarchs adopted a patron-client relationship with democrats to divide-and-conquer them as well as expelled democrat leaders when they refused to be clients. Chapter five examines how oligarchs controlled information to preserve their power by monopolizing information, projecting an idealized image of the polis’ unity, and delivering specific information to targeted audiences. Oligarchs employed practices of secrecy; projection of power in drama, sacrifices, and public banquets; manipulated and destroyed certain monuments; and deployed specific information to certain groups. By regulating public spaces and information, oligarchs were able to consolidate their rule. Chapter six explores the consequences when oligarchs’ institutions began to decay and ultimately collapsed. Unguarded public spaces and not properly regulated festivals allowed democrats to gather together and plan revolts. Military campaigns also were situations when democrats would attack oligarch regimes: when the military returned to the polis after a campaign or sometimes during the campaign itself. A third incident when oligarchs’ institutions collapsed was the breakdown of consensus within their own class caused either by exogenous or endogenous variables. The end result in all of these cases was stasis (civil war) between rich and poor. In the afterword, Simonton argues that the early Hellenistic period, when oligarchy ceded ideological ground to democracy, was the high point of democracy in the classical world. Contrary to those who claim that this era was the graveyard of democracy because of the rule of Alexander the Great or those who claim classical period was the apex of democracy, Simonton contends that democracy was the only legitimate ideology during the early Hellenistic period for Greeks to organize their poleis. In fact, he points out that Alexander the Great supported democratic regimes in Asia Minor, thereby showing this time was hardly the graveyard of democracy. For Simonton, the lack of concentrated power prevented democracies from acting impulsively and the belief that democrats were more humane and gentle when compared to oligarchs prevented democracies from spiraling out of control like oligarchies. As democracies continue to be established throughout Hellas, oligarchs’ arguments justifying their rule became less persuasive. Although well-designed institutions kept them in power for a little longer, these practices eventually would be ineffective in a world where democracy was considered the norm. Classical Greek Oligarchy is a masterful book that seamlessly combines the current scholarship and classical historical evidence to bring light to a neglected but very important topic for today: how oligarchs were able to preserve their rule. Accessible and erudite, each chapter clearly spells out the argument and marshals abundant evidence to support it. Making a significant contribution to the scholarship of classical history, philosophy, and politics, Simonton’s book will have enduring value on the topic of oligarchy and how it was practiced in the ancient world.